April 27, Holy Saturday: 1:30p.m., 9:00 p.m., 9:15 p.m. and 9:30 p.m. Blessing of baskets. 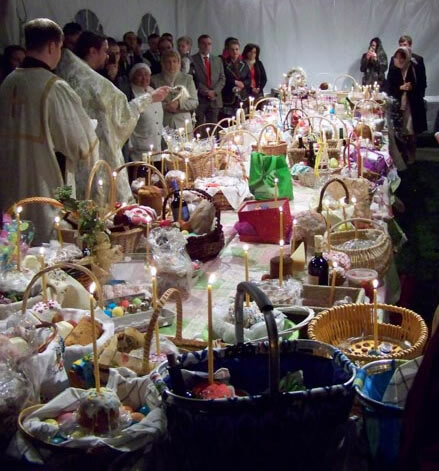 April 28, Easter: Midnight Matins and Divine Liturgy. After the services, blessing of baskets. In the autumn of 2017, as part of the creation of the "Mother's Garden", a hedge comprised of 40 bushes was planted near our church. Support the Accessibility & Expansion Project by purchasing gift cards for your weekly purchases. July 2015: Financial update & letter from Fr. Ilya. February, 2015: We received a letter from Fr. Ilia Kobzar, a priest serving in war torn Donetsk, for whom our parish is collecting funds for humanitarian assistance in the Donbas region. The Donbas/Donetsk region is a humanitarian catastrophe. Children and the elderly should have a right to food and medicine.